Hey, again. Can you believe it’s Tuesday already? One thing I know I’m looking forward to this week, is an extra hour of sewing on Sunday! What, isn’t that why we change the time? Also, who else has already started brainstorming their Holiday Exchange gift? Wait, I’ve already included three questions and none of them are the Quilty Question. I have to get it together. You have already all shared too many new fabrics and made me drool over your dream sewing machines. Great, I’m eating peanut butter and jelly all of 2014. Up this week: Which fabric designer would you love to meet? With everyone down at Quilt Market, they are all blowing up my Instagram feed (more fabric to buy, more quilts to make!) and it makes me wish I could hang out with them! You all probably know my answer already – Denyse Schmidt. Even if I just got to tell her that Chicopee started my obsession with quilting, that would be enough. I lie. I would need to pick her brain some more. So, that’s it – which fabric designer would you choose to meet? My quilt heroes are Elizabeth Hartman and Angela Walters (also Jaquie Gehring and Alissa Haight Carlton), but my adoration comes more from their skills than their fabric (only Angela has a couple of lines). I love Anna Maria Horner and Violet Craft’s fabrics, but I don’t know much about them beyond the fabric itself. 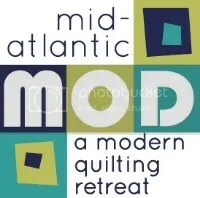 This is fun to think about, and I fantasize about going to the next QuiltCon! I was very lucky to be able to attend QuiltCon this past February, where I met Anna Maria Horner, Lotta Jansdotter, Elizabeth Hartman and Jaquie Gerhing. They were all very approachable and humble. But Jacquie was a hoot. She just did a class (yesterday or the day before) for the Austin MQG and the attendees are singing her praises on FaceBook. So, my choice would be to spend some time with her, although she is quilt designer and not a fabric designer. I would like to meet Marcia Derse. She dyes her fabrics and her fabric lines are amzing. I actually found her fabric, to touch and drool over, in a shop called THREADS of TRADITION located in Sauder Village, just outside of Archbold, Ohio. Funny thing, Marcia’s fabrics are anything BUT “traditional”….modern all the way. I discovered her line(s) probably 4 years ago and have been collecting them ever since. Maybe one day I will have enough courage to actually cut the pieces I have been collecting, and use them in a quilt! Malka Dubrawsky- I discovered her “simple marks” line this past summer, and I loved it so much I went on-line, and purchased every design I this line. I just started to make simple blocks which I will eventually make into a quilt. I would love to understand how she puts her collections together. carol Bryer Fallet for sure. Already met Kaffe Fasset last year and knew Ginny Beyer years afo when she was just starting out as she was part of my VA quilt guild. she is a very special lady! Has to be Ginny Beyer – I’ve wanted to meet her since the early 70s! From what I’ve seen and heard on the internet, she seems a very interesting person; definitely someone I’d like to speak to! She’s not my favorite designer though. If we’re talking quilt designer, I’d go with either Elizabeth Barton or Jacquie Gering. For fabric designer, there are a million – but I’ll agree with Daniela re Anna Maria Horner. I would love, love, love to meet Anna Maria Horner. She is a master with color and with design. She seems so genuine, approachable…what you see is what you get.